What role might zoo animal play in the survival of Amur leopards? Following on from Dr John Lewis’ talk at Nottingham Vet School (see WVI News), I (Heather McKay) was interested to attend a subsequent event at Twycross Zoo to hear of any updates to Wildlife Vets International’s project with Amur leopards. 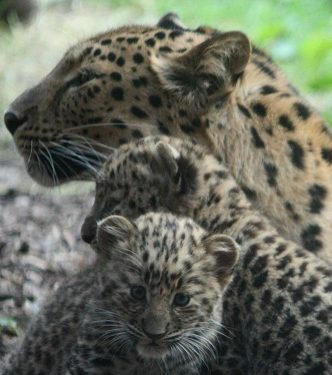 Twycross Zoo is in the heart of the East Midlands, and can boast the birth of two female Amur Leopard cubs last year, adding to the 200 or so individuals in the global captive population. There are around 60-80 of these animals left in the wild, and are greatly threatened by poaching of prey species. But what role might these zoo animals play in the survival of Amur leopards? Wildlife Vets International, of which Dr John Lewis is the Veterinary Director, are working alongside the Russian Authorities to plan and implement a reintroduction programme whereby captive-bred Amur leopards are released into the wild to re-populate parts of the leopard’s habitat. Proven breeding pairs will undergo a rigorous assessment process including health, disease and genetics. Once the breeding pair have been given a clean bill of health, they will enter the reintroduction programme, encouraged to breed, their cubs will then be raised away from all human contact, where they will learn all the skills that they will need to survive in the Russian Far East. The release area has no leopards here at the moment, so there will be no direct competition. However, the area is home to the Amur tiger – a much larger species that might see the smaller naïve leopards as potential prey. This means that before they are released the leopards need to be taught that tigers are to be avoided – just one of many challenges for the reintroduction team. The health of the existing population is being monitored as closely as is possible – with so few animals across a vast area that isn’t hospitable to humans, this is no easy task. Traps are set, and on occasion they successfully capture a leopard for a thorough health check. More commonly, the health of the animals is assessed indirectly through camera traps, and looking at the diseases found in ticks and other animals in the area. Finally, the disease risks of the programme need to be considered – the new leopards might come across diseases that they are not immune to, or even worse, they might bring things with them that could affect the native populations of endangered Amur leopards and tigers. Surveillance is an ongoing project requiring dedication and foresight, and Wildlife Vets International are in it for the long haul. The release site has been identified, as has the target range. There are few things that still need ironing out, such as whether the cubs will be bred in Russia or the UK, or both; and the centre is yet to be built. However, reports are that the Amur leopard reintroduction project has enthusiastic support from very high up in the Russian government. This ensures support and a degree of funding for the project, and means that potentially things can start to move very quickly indeed. Dr John Lewis’ parting thought of the evening was that when we visit these stunning creatures in a zoo, we might be looking at an animal who will go on to be the parent of reintroduced leopards – founding individuals of a population that might save the species from extinction. Reintroduction of carnivores is a difficult task, but with WVI behind this project, things are looking hopeful for the Amur Leopard. Heather McKay is a third year vet student at Nottingham Vet School, where she is the Talks Officer of the University’s Veterinary Zoological Society. She has worked with the Blue Cross, and as a veterinary nurse in the UK and in East Africa, where she was also a volunteer animal keeper at Uganda Wildlife Education Centre. She holds an undergraduate certificate in Wildlife Conservation, and has interest in conservation medicine, infectious diseases and global health. She is about to take a year out of the vet course to undertake a Masters in Research, looking into bovine TB in badgers in the UK. Twycross Zoo’s Amur leopard enclosure is part of the Himalaya exhibit, an area of the zoo that is free to enter. Twycross Zoo and Big Cat Sanctuary (was Wildlife Heritage Foundation) are both long term supporters of WVI's involvement in the Amur Leopard Reintroduction Programme.